Making living logic gates today is not as hard as it was previously predicted by scientists. As we mentioned in one of our previous articles regarding genetically modified yeast cells, these systems suffer from the signal noise that occurs after a single cell has been stuffed with many functions. A team of researchers from the University of California, San Francisco (UCSF) has avoided this problem by reducing the number of functions a single cell can perform. When arranged appropriately, these bacteria can perform any possible logical function. The researchers used promoters that activate nearby genes in response to simple chemicals (arabinose and tetracycline). When either of the chemicals was present, the reporter of a cell was on, thus it acts as an OR gate. In order to create a NOR gate, the researchers linked promoters to the gene for a protein that shuts down genes near any promoters it binds to (termed a repressor). So, whenever there is a presence of arabinose or tetracycline, the repressor is expressed. By linking a reporter gene to a promoter that was bound by the repressor, the final output gets inverted. Hence, when either chemical was present, the reporter was shut down. The researchers relied on genes that bacteria use to signal each other in order to simulate the wires in traditional electronics sense. 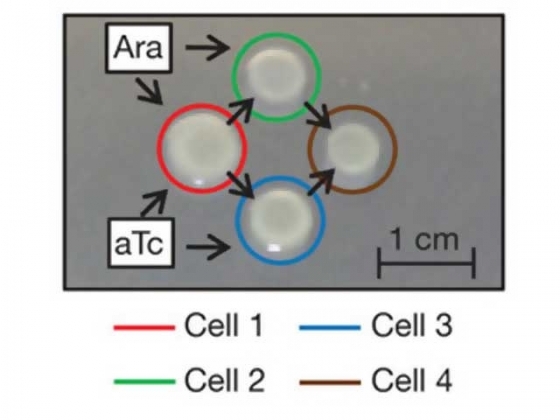 When produced by one bacterium, these quorum signals diffuse to its neighbors, where they regulate genes that change in response to the population density. In the recipient cell, they act as the chemicals used to control the logic gates, because they link up with proteins that regulate promoters. The NOR gate can also be used to control the expression of one of these quorum signals. In the receiving cell, the promoters that respond to arabinose or tetracycline could be swapped out for a quorum-responsive promoter. This makes some of the bacteria respond to the output of their neighbor’s logical gates, instead of responding to the chemicals in the environment. In order to test their idea, the researchers made small clusters of bacterial colonies of E. coli, where each colony had a single logic gate. Depending on the arrangement of the colonies, each one could signal to only one or two neighbors, and each could only take input from one or two. They demonstrated a functional XOR gate built from four colonies, thus showing that all logical functions can be built from similar combinations. The automation of these complex operations and design choices could advance basic and applied research in synthetic biology. The future goal of the researchers is to be able to program cells by using a formal language that is similar to the programming languages currently used to write computer code. Advantage in using populations of cells is in the possibility to average out some of the chaotic behavior typical of systems based on single cells. Downside of this approach is the increased size of a system, compared to the single cells with more complex functions. You can find more information in a paper published in the Nature named: “Robust multicellular computing using genetically encoded NOR gates and chemical ‘wires’“. This entry was posted on Thursday, Dec 30th, 2010 at 5:15PM and filed under Bionics, Tech.